This week is my elder daughter's exam week. She has her mastery test scheduled from Wednesday to Friday. As a mom who wants her daughter to be motivated and bright, I try my best to prepare a delicious lunch and prepare a filling afternoon snack for school. The bento boxes I created since Monday have more choices from fruits to cupcakes and wafers. Most of them are simple and very easy to prepare just like this one. 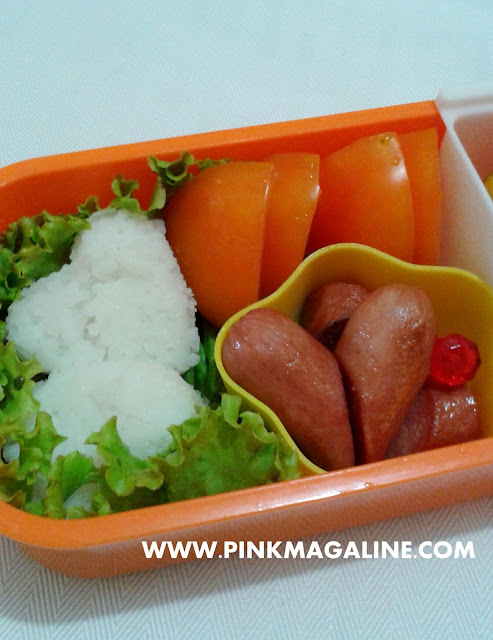 Steamed rice and sausage, pretty much the same with the last bento box I shared HERE. To balance the meal, I added tomato slices and banana on the side. Simple as it is. My gradeschooler was able to finish this meal except for the lettuce which only served as a garnish. Btw, I bought a new set of food picks to be added in my bento tool collection. They are so cute with flowers and bows. Watch out for my new bento entry 'cause I'll be featuring them. 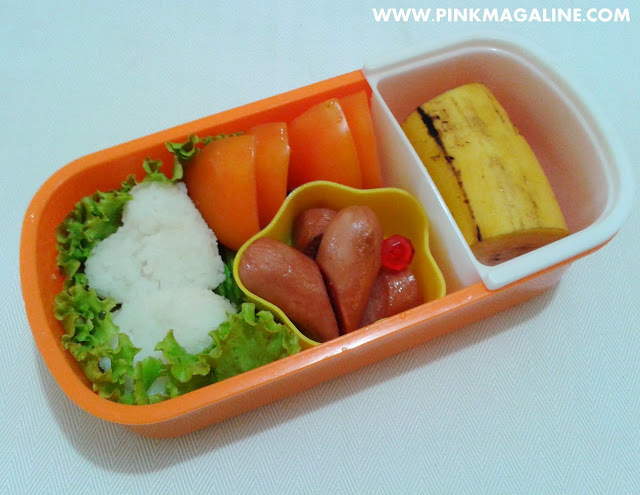 Do you like bento making, too? How do you prepare your kids school baon? Do share. It was a planned trip. 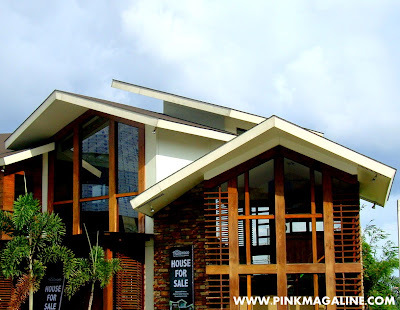 We went up north a couple of weekends ago to unwind and feel the cool breeze of Baguio. Our family left home at around 6 in the morning. The drive was pleasant except for the traffic in Urdaneta. Anyhow, we reached the foot of the Lion's Statue at 11 o'clock. Thanks to the easy trip through NLEX, SCTEX and the new TPLEX. Total drive was 5 hours plus some pits stops like breakfast in Bulacan and answering the call of nature in Urdaneta. Mind you, I've been to Baguio four times before. I was there in October of 2000, went back in February 2008 for Panagbenga, once again in July 2011 and then followed by a seminar at Teacher's Camp in September 2012. Now for the 5th time and in the month of November, here's a photologue of our visit to the summer capital of the Philippines. This is our small family, stopping by for a photo op with the lion statue carved from a big stone. From this landmark to the main city is another 20 minutes drive. This is where we stayed for two nights, the Microtel by Wyndham. In case you guys are interested, I'll publish a separate entry about it later on, so check back for my review. Love this flower with different colors from a stall near Burnham Park. I'm not sure how they call this flower, though. If you happen to know this flower, please do share in my comment box below. More colorful blooms. The fresh and beautiful flowers of Baguio are a sure hit to tourists. They are the reason why Baguio City holds a flower festival every year. Us again, looking for strawberry taho in Burnham Park. Taho, where are you? Here, hubby and I sat on a bench while the kids and my cousins ride a boat. We also hired bicycles and ate some street food to kill time. We were at The Mansion the next day. Generally, the weather was fair during midday, but chilly in the morning as well as evening. In November, temperature changes from 14° to 25° from day to night. At the Botanical Garden's entrance, we paid P10 to each of these grandmas for a photo op. They're so funny esp. the one who dictates what kind of pose to do in every take. Haha. Inside the garden, we paid P20 for every costume we rented. My baby daughter liked the flower baskets and headpiece a lot. Isn't this cosmos? This variety is very pretty with double petals. Caught a tiny bee pollinating this super pink beauty. If I could only pick some flowers to take home. We passed by Bell Church on our way to La Trinidad on our last day in Baguio. It's a place of worship so entrance is free. We got lost finding the strawberry farm. Haha. Blame that to hubby who sometimes fails to follow the navigator. Sad news.. there's no strawberry picking in November. Most fruits are still tiny and green. They won't be ready for picking until late December to February. We had the yummiest strawberry ice cream in La Trinidad. Like really, it was really unforgettable. After this trip, I realized that Baguio isn't worth the long ride it anymore. It has bigger population, lots of buildings and establishment everywhere in the city, and houses look like piled one after the other. The terrible thing is, there's too much traffic even on a Sunday! Okay, the weather is nice and they have the freshest veggies, something that people from Manila and other nearby provinces envy so much, but I can see danger in those narrow and winding roads. I guess it will take a long while before we can think of going back to this place again. So long, Baguio! What does it feel like living in a country where Christmas is celebrated as early as September? I think you can guess it right. It feels totally awesome! Chances are, you get to hear Jingle Bells while shopping for Halloween costumes or see a full display of colorful lanterns on the streets even before Halloween. For me, it gives excitement and a cheerful disposition towards others. Anyway, like I said, Christmas is earlier here than any other part of the world, so we already erected our tree and slowly hang ornaments. This years Christmas tree theme is winter wonderland. You guys must have seen my DIY Christmas balls in our bare tree. Today, I am sharing an easy tutorial of the additional decor we hung to our 6 feet faux evergreen-- glue snowflakes. 1. Create a design at the back of the plate. Allow it to dry before scraping off. 2. Apply more more glue by tracing the back, creating a snowflake which is strong enough to stand. 3. Add sequins or bead to decorate. I used sand for my frosty snowflakes. 4. Tie the snowflake with a string before hanging in the tree. I did this project, if I'm not mistaken, back in August, right after I finished the blue floral dress. Practice makes perfect, that's what they say, so I am trying to master the art of sewing baby dresses and girl dresses for my two daughters. You know, it was my dream to do this thing, and believe me, the feeling of accomplishment every end of each project is very strong. As a hands on mom, I can be very busy, getting caught up between cooking, cleaning up after my kids, breastfeeding and stuff, but of course, I shall always find time to bring out my machine and create something. If you examine this dress closely, you'll notice that there is something wrong with the shoulders. I still can't figure out how to conceal the hem in that area. I also ran out of pink fabric for the front bow and back ribbon. Anyhow, I like it that the armholes are perfect and the back closure is looking neat. My little one wore this dress to church one Sunday, but I totally forgot to take photos. Anyway, like I said, I am still on the practicing this craft so pardon if there is no tutorial yet. Basically, I just pulled a dress from the closet that fist nicely to my baby daughter, traced the pattern from there, cut the fabric, and sew right then. 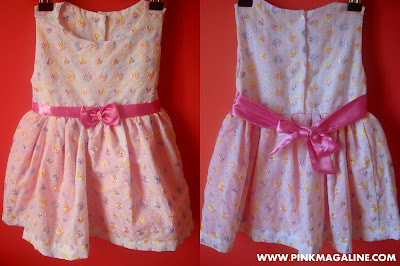 Good news, I have a new dress done and is up for the next sewing post. I know I was supposed to feature it for Halloween like I mentioned in my IG. It doubles as a holiday dress, too, so please wait as I try to come up with a tutorial for it. Till then. I found a new way of cooking meatballs. Rather than frying or throwing them in a boiling pot of sauce, I'd pop them in the oven and baked until golden brown. I have to be honest here, though, that this is not my personal idea. I just saw this from a random channel in YouTube and I thought I would give it a try. Hubby loves meatballs as much as he loves pasta dishes. So, here we go. There are 3 major procedures to follow in making this meatball recipe. First is to prepare the meatballs, second is to cook the filling, and lastly is to ready the topping. Here are the list of ingredients. -Combine all the ingredients for the meatballs. Mix well. -Form into small bowls. Arrange in a baking dish. Bake for 8 minutes. Set aside. -Saute onions in butter until light brown. Add mashed potatoes. Mix well. -Fill each meatballs with mashed potatoes then top it with cheese. -Mix tomato sauce with water, then drench the meatballs with the mixture. -Bake the meatballs for 5 more minutes or until the cheese melted. Serve. The result of this recipe is cheesy and delicious meatballs. This is perfect as an appetizer or a side dish. A great addition to your holiday menu. Try it! Do you feel the cool breeze? It's almost Christmas. Just 49 days to go. In preparation for the holiday season, I got rid of our old Christmas tree and bought something bigger. As I have a certain design to follow for this year theme, I'm gonna be needing new Christmas tree ornaments and accessories in order to achieve the look that I have in my mind. And since the tree I bought is kind of expensive, I'm going to DIY the things that I'll be hanging on it, saving money as much as I can. Here's for project number one. These are DIY Christmas balls made out of yarn. The design I created is simple but unique. 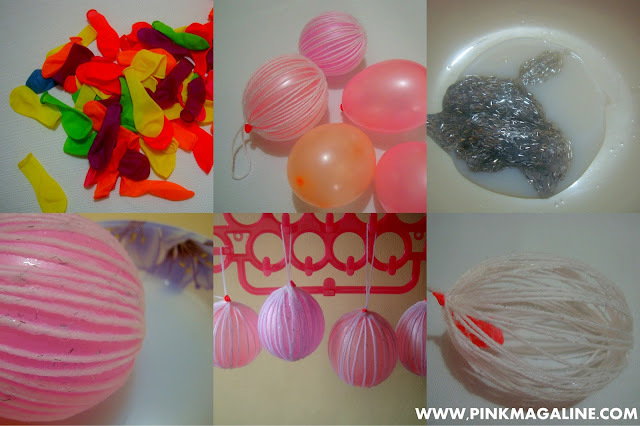 Follow this step by step procedure if you want the same inexpensive Christmas balls for your tree. Step 1. Blow a balloon. Step 2. Cover it with yarn. Step 3. Mix glue with water. Add glitter for added design. Step 4. Wet the wrapped balloon in glue mixture. Step 5. Hang to dry for 24 hours. Step 6. Pop the balloon. This is how the yarn balls look in my new 6 feet tall (not yet done) Christmas tree. Here's a close shot of one of the DIY balls. One can actually play with the design for this project. Use different colors of yarn like red, green, or gold. Follow an overlapping pattern when wrapping the balloon. Aside from glitters, you can also decorate the balls with sequins or studs. Just have fun! In order to change the look of your home, you will need to add some things or take some things away. Renovations can greatly boost the look of the home as well as increase the value. There are some general types of home renovations that you can do, and a contracting company can help with the work if you aren't sure how to get started. If you want more curb appeal, then you need to work on the outside of the home. Remodel the lawn, add some flowers or a sidewalk and make sure you keep the lawn looking as neat as possible. Paint the shutters, or add a new swing to the carport. Lighting also helps as it will brighten the area at night. Some of the bigger projects that are more expensive will also increase the value of the home. This is beneficial if you plan to sell the home at a later date. Paint the walls, add carpet, and replace the cabinets in the bathroom and kitchen. You can also add new appliances or furniture. If you need more room, you can always remove a wall to make a space bigger or add an entire room to the home. Get more information about home renovations by looking online.